"Do you fast? Give me proof of it by your works. If you see a poor man, take pity on him. If you see a friend being honored, do not envy him. Do not let only your mouth fast, but also the eye, and the feet, and the hands and all the members of our bodies. Let the hands fast, by being free of avarice. Let the feet fast, by ceasing to run after sin. Let the eyes fast, by disciplining them not to glare at that which is sinful. Let the ears by not listening to evil talk and gossip. Let the mouth fast from foul words and unjust criticism. For what good is it if we abstain from birds and fishes, but bite and devour our brothers?" Think for a moment, about the purpose of a tripod. By definition, it is a stand that provides three-legged support to steady an object placed on it. It might serve to secure a video camera for recording a granddaughter's graduation from pre-school or perhaps to stabilize a telescope for an astronomer gazing into the wondrous night sky. But what would happen if one of the legs was shorter or if all three of the legs were different lengths? For a tripod to provide the necessary balance, each leg of the tripod must be of equal length. Like the tripod, our approach to Great Lent should include three equal supports that will to give us the balance we need in our spiritual climb - fasting, prayer, and almsgiving. From the earliest days of the church, the Great Fast was not solely about abstaining from food. The physical fast was always accompanied by increased prayer and almsgiving. As families, we should look at all three of these elements in order to put into practice a broader and more fulfilling approach to Great Lent Regardless of varying ages and levels of spiritual maturity, your family can share the joys and struggles of the journey towards the Resurrection. Taking the time to create a Lenten family plan will help you properly prepare for Pascha. As you begin, make sure to check with your parish priest or spiritual father for guidance. Fasting from food is an important facet of our Lenten discipline. Jesus Christ, Himself, prepared for the rigors of His ministry by fasting from food for forty days and resisting Satan's temptations. And after casting out a demon which inhabited a child, His disciples wondered why they were not able to perform the exorcism. After rebuking the disciples for their lack of faith, He said, "However, this kind does not go out except by prayer and fasting," (Matthew 17:21) thereby extolling the virtues of proper fasting. Abstinence from rich and heavy foods - as well as monitoring our portions - is cathartic for the body and refocuses our hunger and desire for God. As nutritional requirements vary from one family member to another, the decision for a meal plan covering Great Lent should be discussed by parents and other heads of households with guidance from your parish priest or spiritual father. Medical or physical conditions may override strict adherence to a fasting diet. Just as Jesus prayed during periods of great temptation and troubles, so are we to turn to God in prayer to guide us through the 40-day period. This Lenten period affords numerous services which help to strengthen the faithful in preparation for the Resurrection. Services such as the Canon of St. Andrew of Crete, Saturday of Souls, Great Compline, Pre-Sanctified Liturgy, Salutations to the Theotokos, as well as the five special designations for each Sunday in Lent serve to strengthen our resolve. And while liturgical participation and prayer are year-round necessities of our lives as Orthodox Christians, these tools and weapons are to be especially honed during Great Lent - a time when the great deceiver, Satan, will tempt us endlessly with diversions to take our focus away from God. Private prayer, in addition to corporate prayer, should be increased. Families should gather together at the home iconostasis with more frequency. Focus on quality and concentration of your prayer and not necessarily duration. Speak with your parish priest or spiritual father for further guidance in developing a Lenten rule of prayer for your family. Almsgiving is often completely ignored during the Lenten season. Many times, it seems that Christian philanthropy is limited to a food drive at Thanksgiving or charitable gift-giving at Christmas. 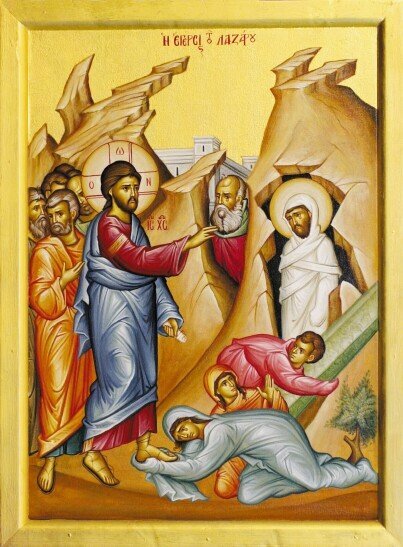 As wonderful as these generous acts are, how can we neglect our duty to assist others as we prepare to celebrate the Feast of Feasts and crux of our faith - the Resurrection of our Lord and Savior Jesus Christ? We know as CHristians, there is no particular season for human need and suffering. Here, as a family, you may become very creative in devising ways to be charitable during Great Lent. Gather up unused clothing that hangs in the closet to distribute to the needy. Grab a few canned goods from your pantry to give to a food bank. Go visit a sick member of the parish family in the hospital. Lend a sympathetic ear to a friend who has hit hard times. Include a Bright Week visit to a nursing home to sing "Christos Anesti / Christ is Risen" to share the joy of Jesus Christ's Resurrection with our Orthodox Christian brethren. Almsgiving goes far beyond the giving of tangible gifts. It is also the giving of our hearts and minds to the ailing, disheartened, and lonely. Above all, we should abide in love. As a family, choose your words wisely when addressing others. Be patient and considerate. Forgive past grudges and seek understanding. If you are not regularly going to the Sacrament of Confession, this is a most-blessed time to seek the Church's forgiveness and sanctification before receiving Holy Communion and Holy Unction. We should be aware these sacraments are administered in love and bestow upon us God's ever-abundant grace. Fasting, prayer, and almsgiving - like the tripod, we need all three supports to keep us in balance during Lent. When in balance, we are able to fully experience the resplendence of the Resurrection and proclaim: Christ is Risen! Truly He is Risen! George Tsongranis is the assistant director of the catechism program at St Nicholas Greek Orthodox Cathedral in Tarpon Springs, Fla.